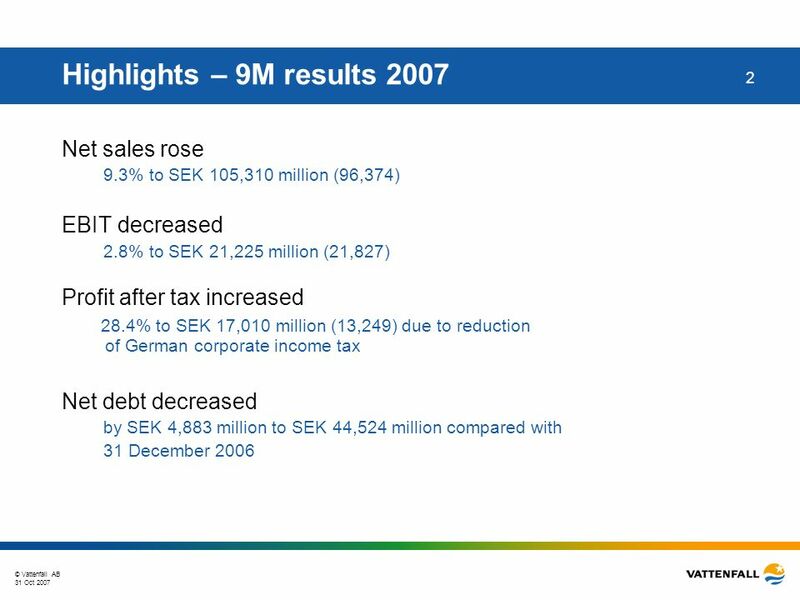 © Vattenfall AB Vattenfall Q3 Results 2007 Presentations by Lars G. Josefsson, CEO and Jan Erik Back, CFO 31 October 2007. 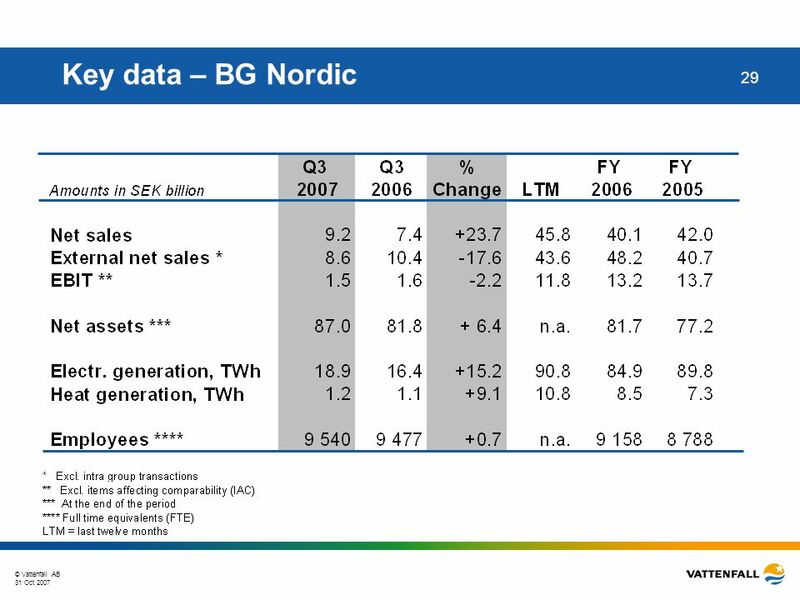 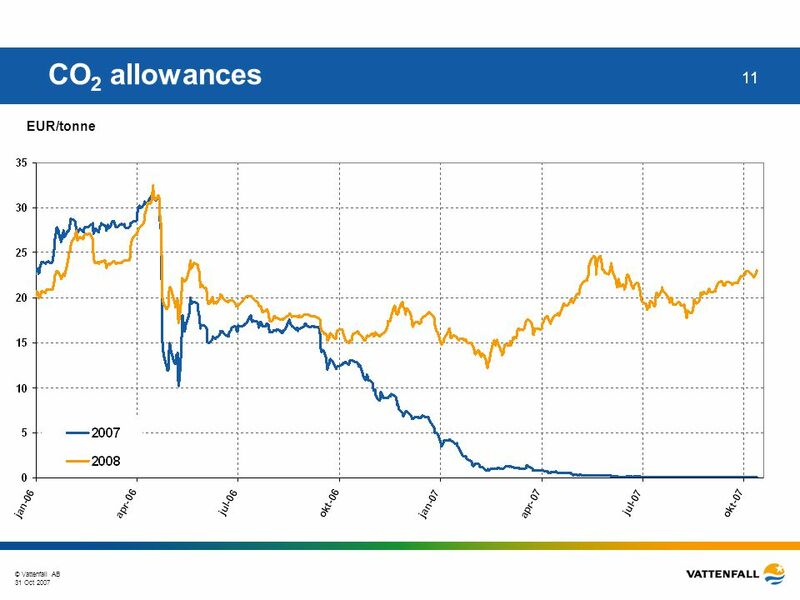 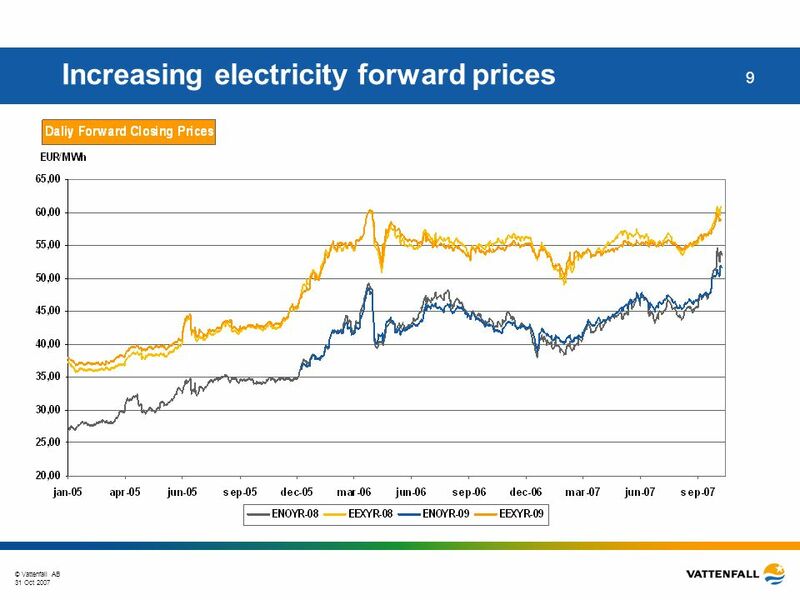 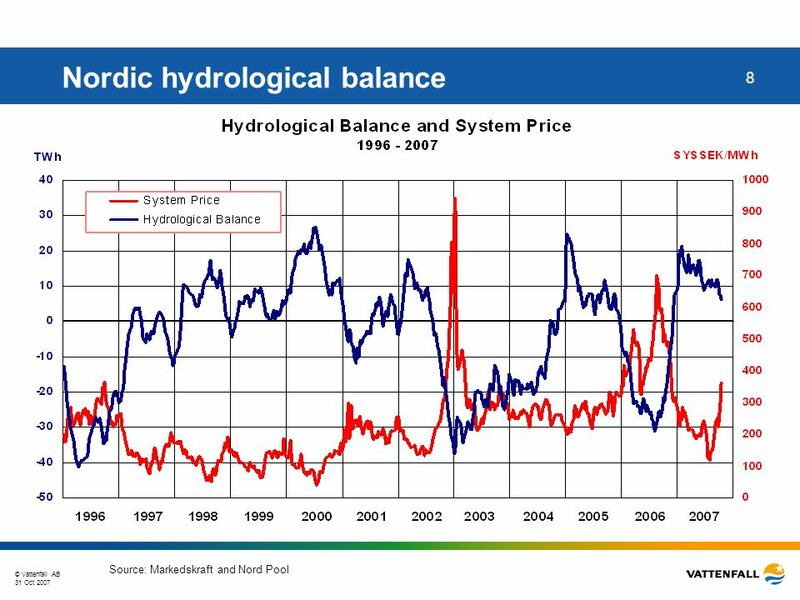 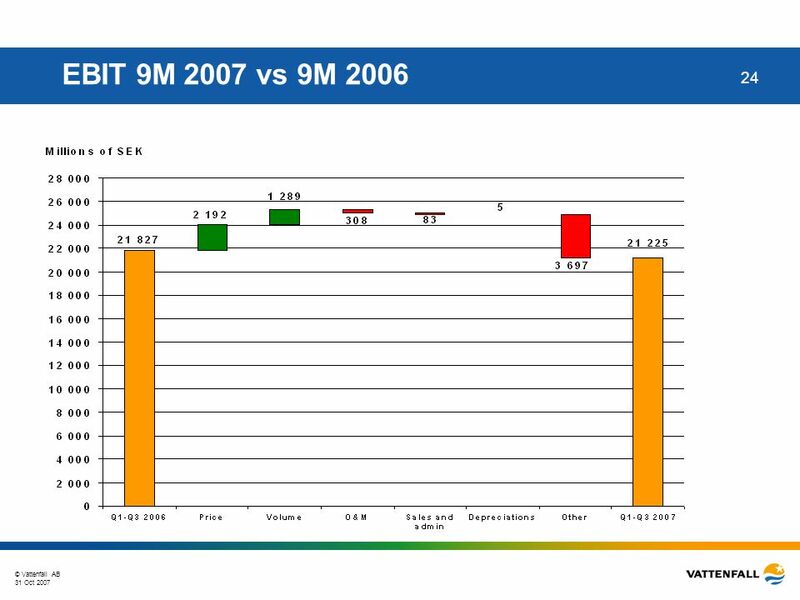 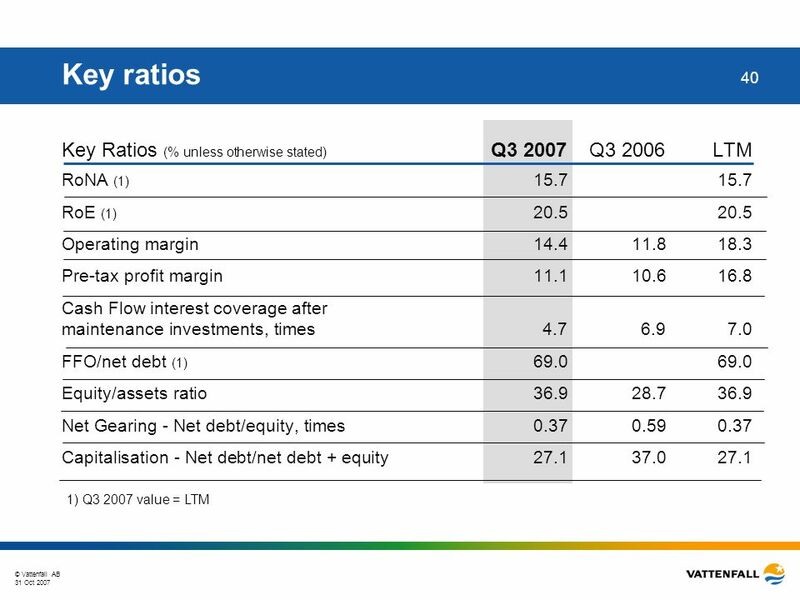 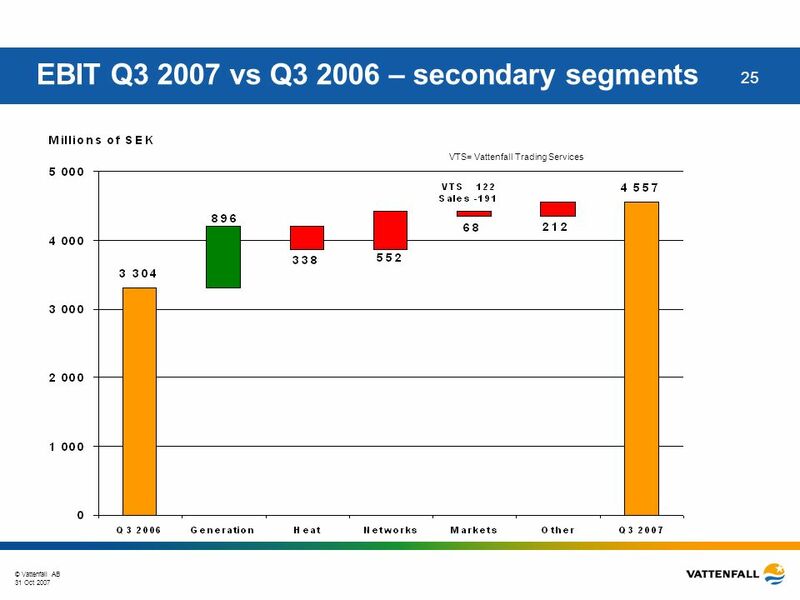 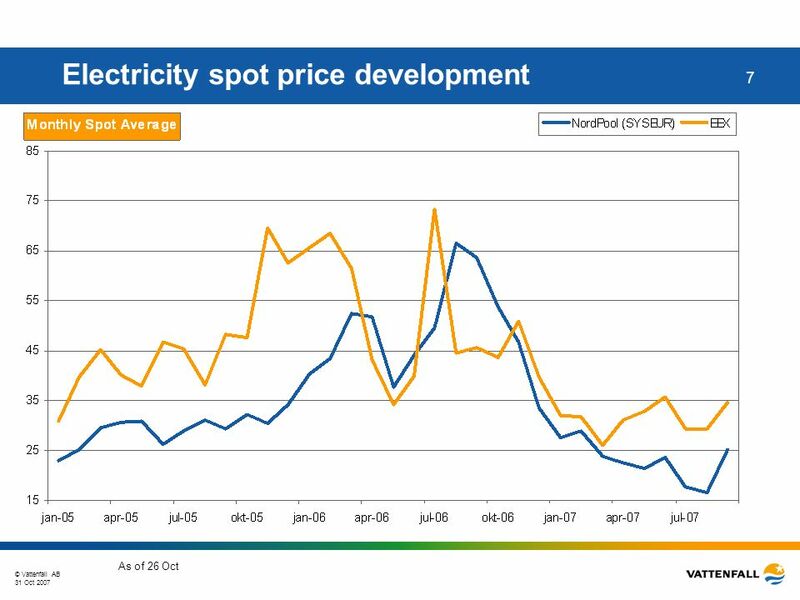 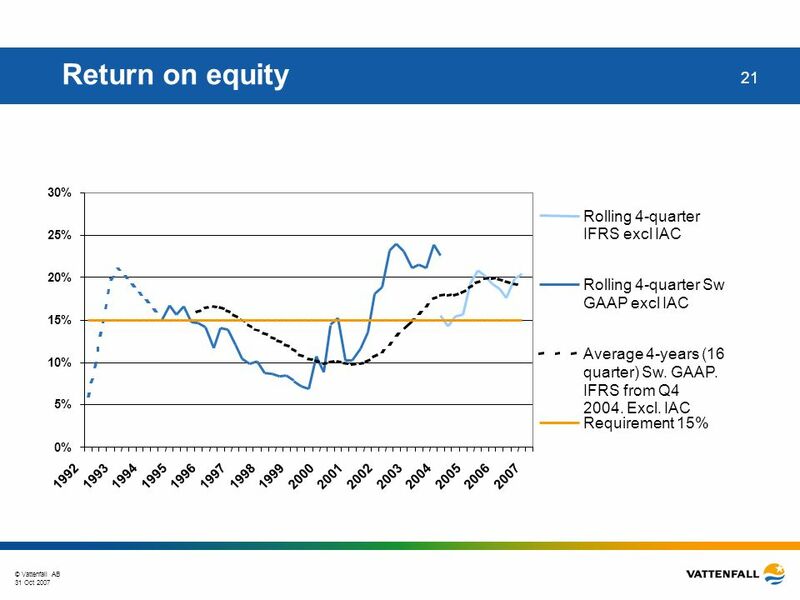 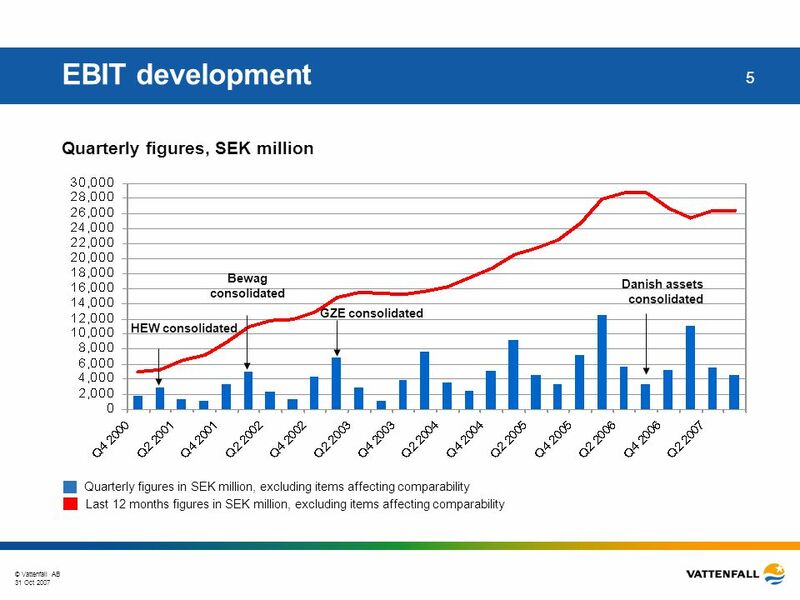 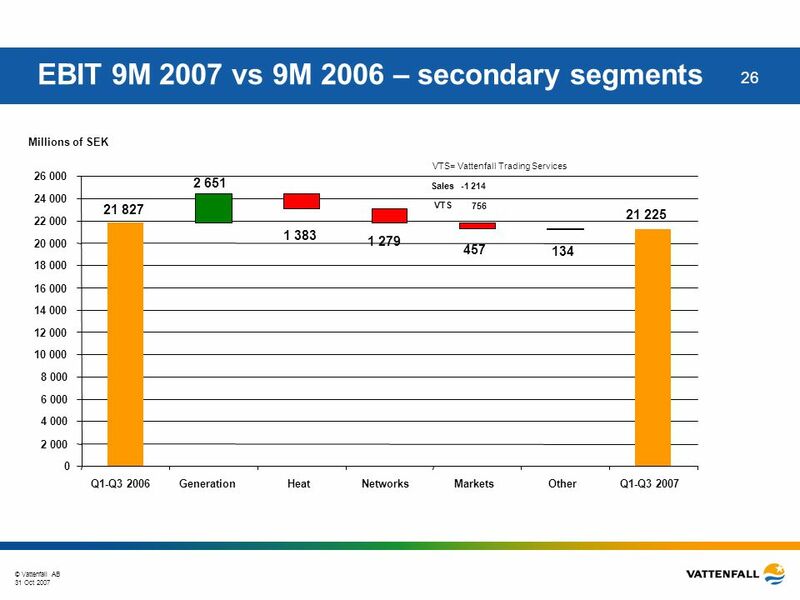 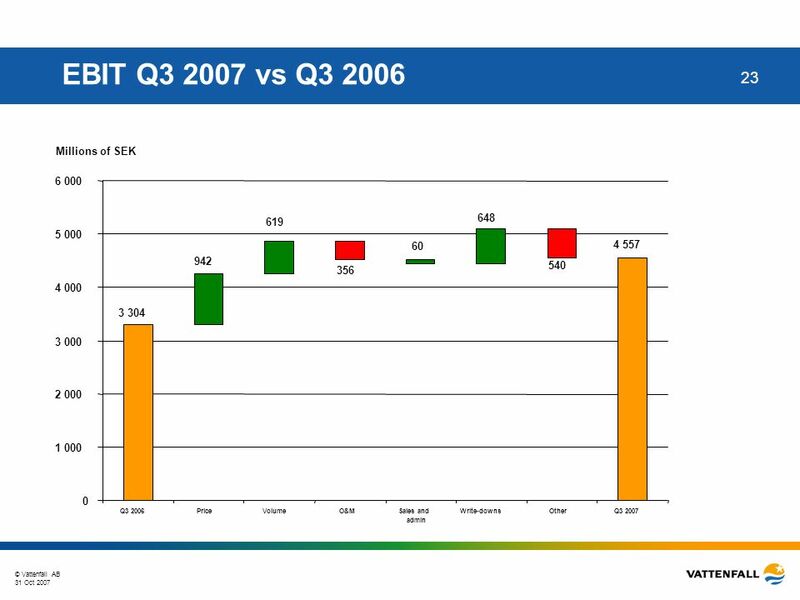 28 © Vattenfall AB 31 Oct 2007 28 Highlights Q3 2007 - Nordic EBIT almost flat compared with Q3 2006 Sharp decline in Nordic spot prices mitigated by hedging. 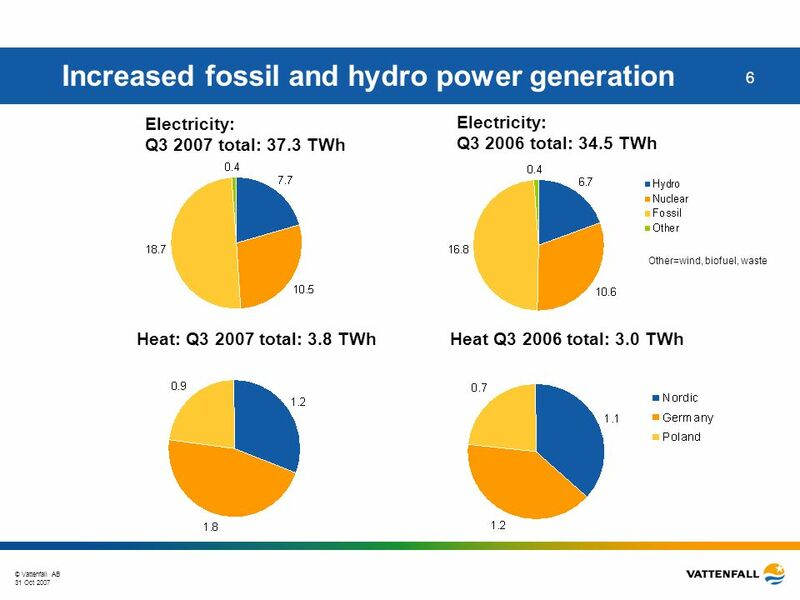 Higher electricity generation due to increased hydro and nuclear power. Lower results in Distribution due to a provision of approx. 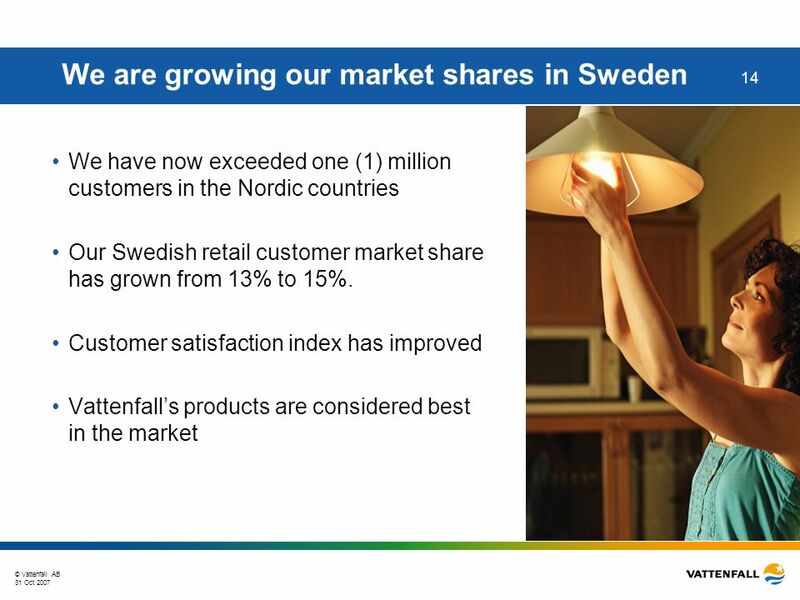 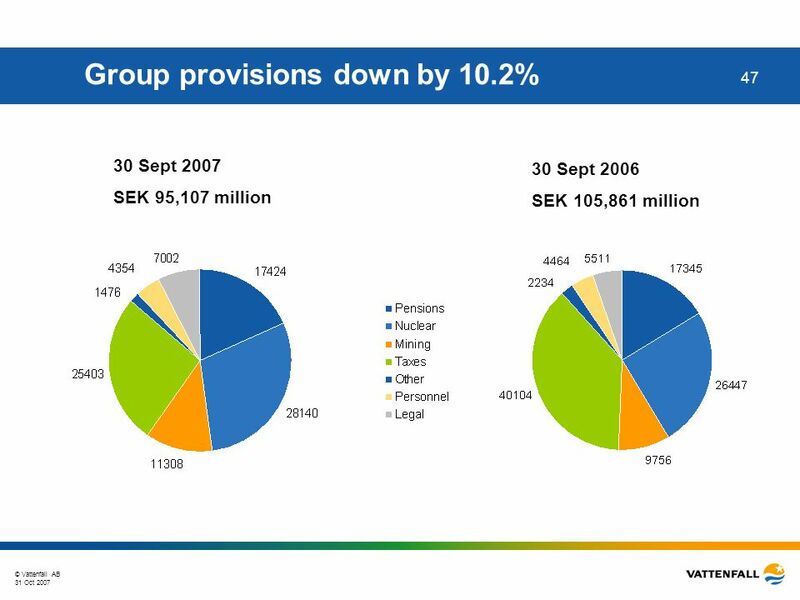 SEK 100 million for restructuring measures. 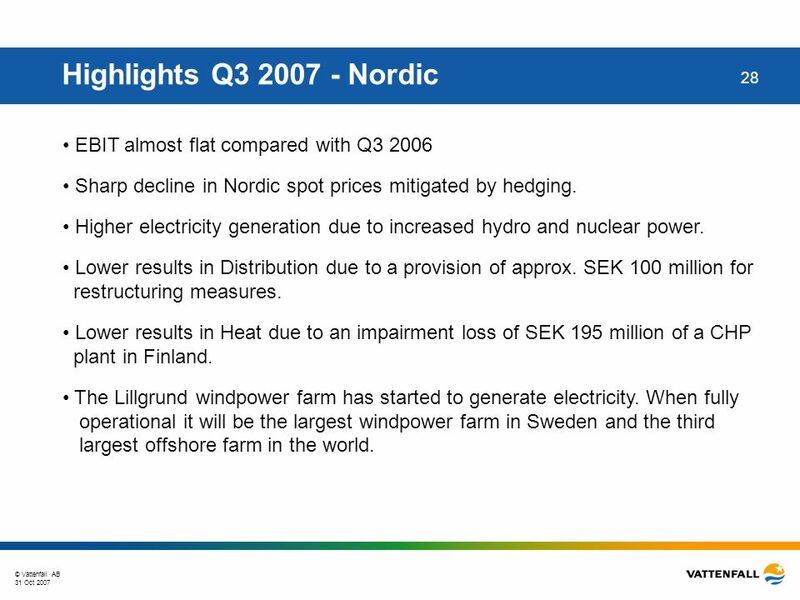 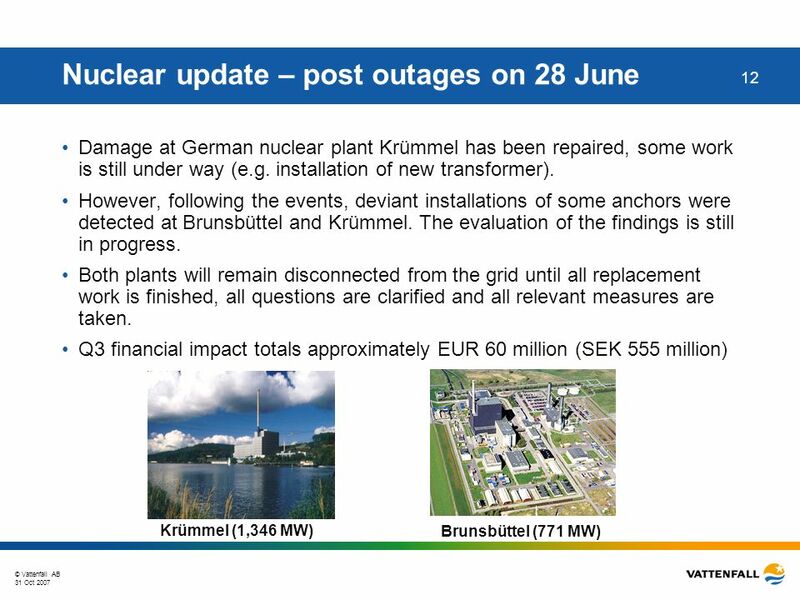 Lower results in Heat due to an impairment loss of SEK 195 million of a CHP plant in Finland. 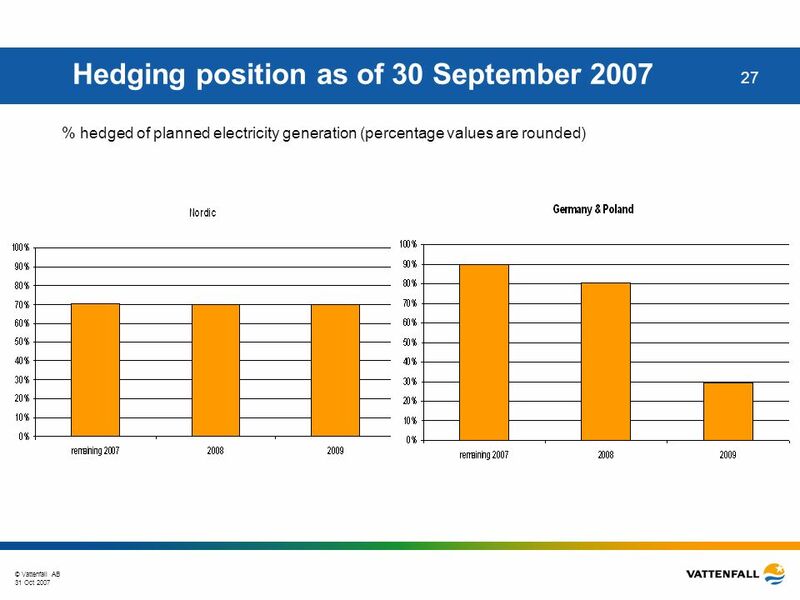 The Lillgrund windpower farm has started to generate electricity. 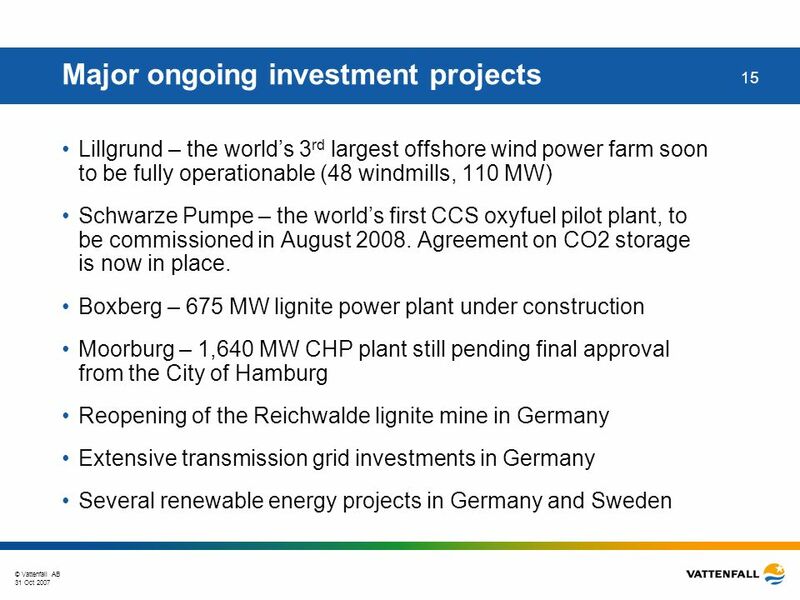 When fully operational it will be the largest windpower farm in Sweden and the third largest offshore farm in the world. 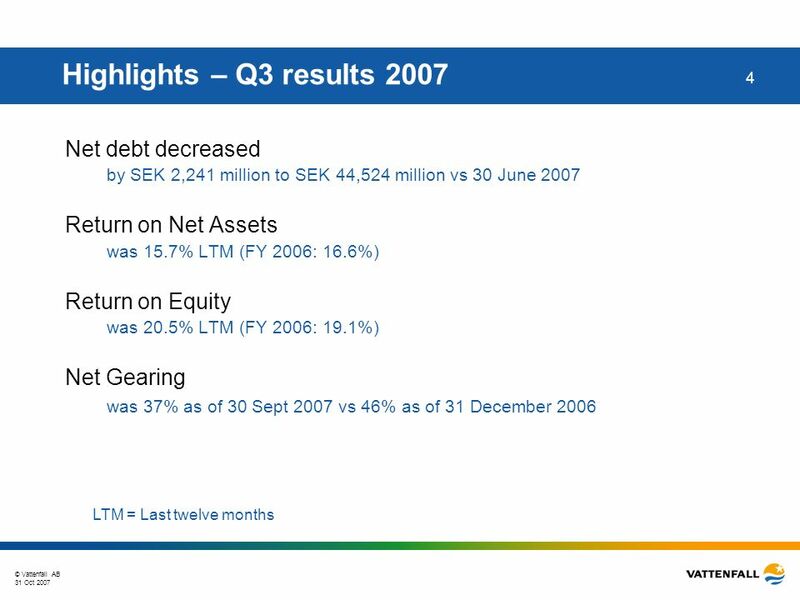 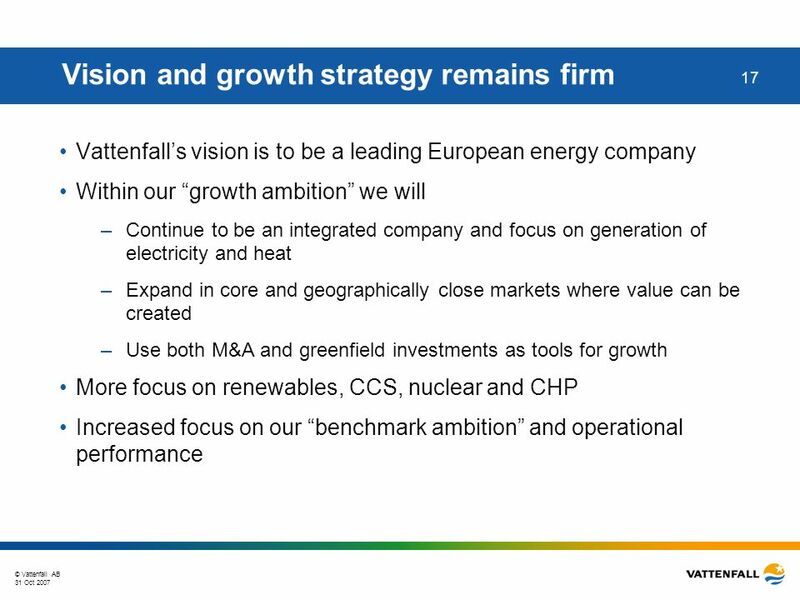 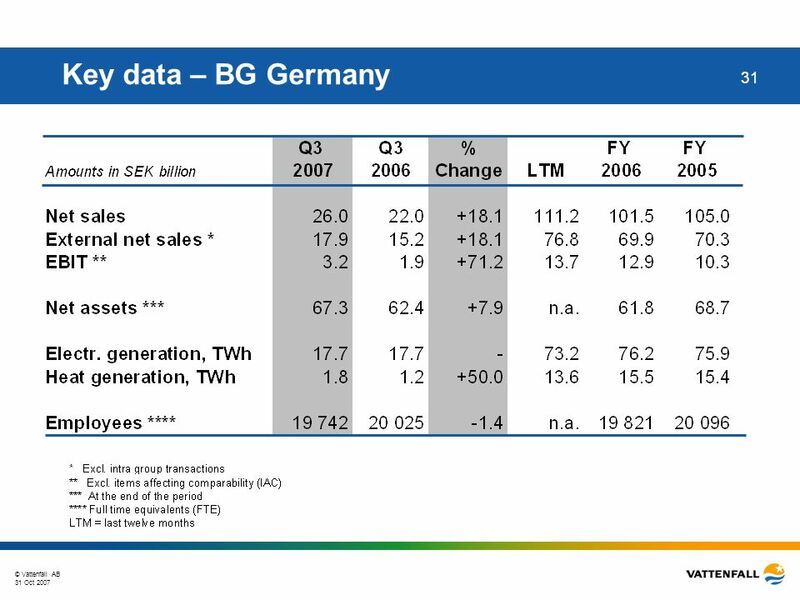 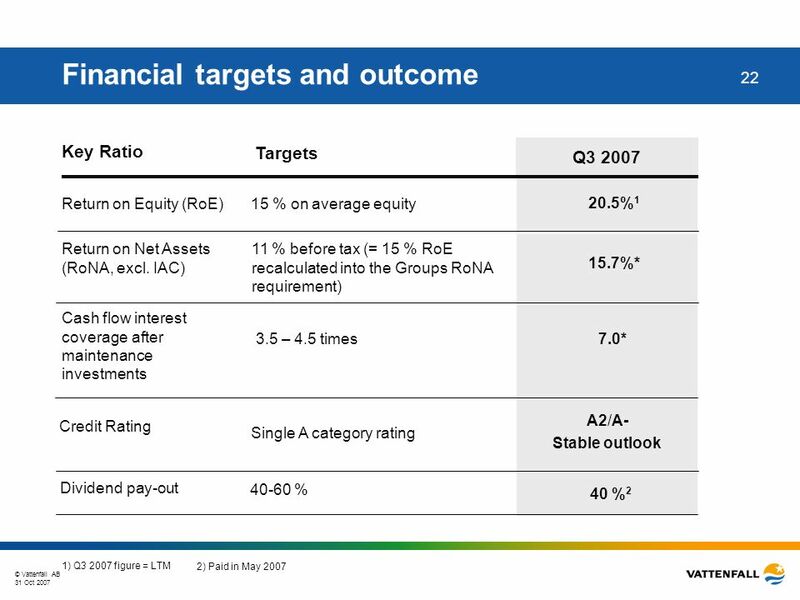 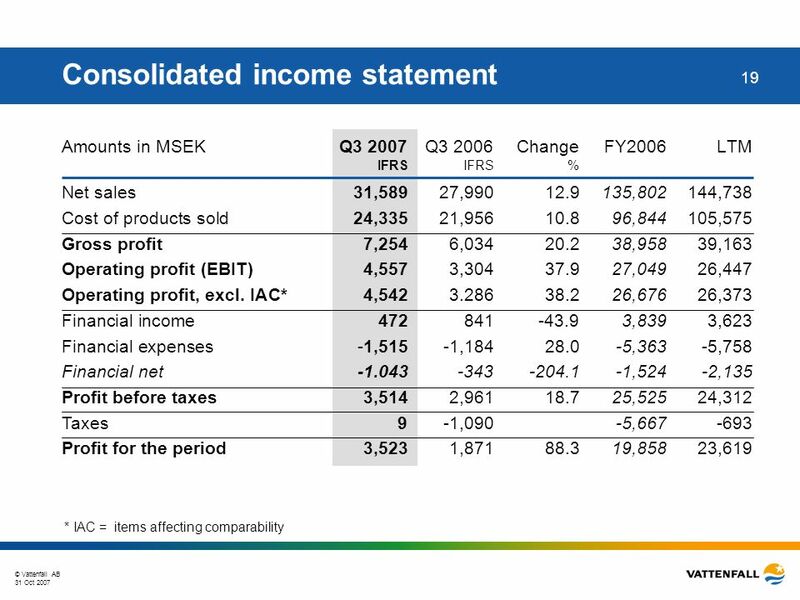 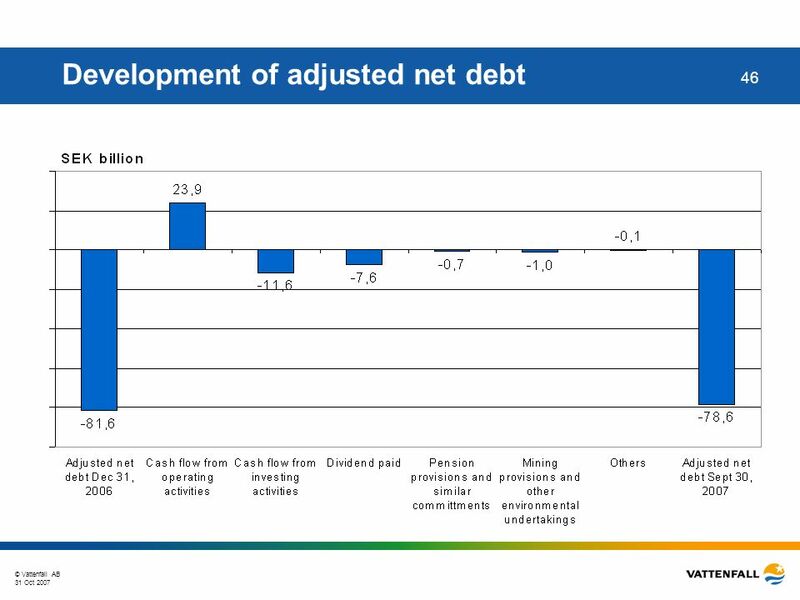 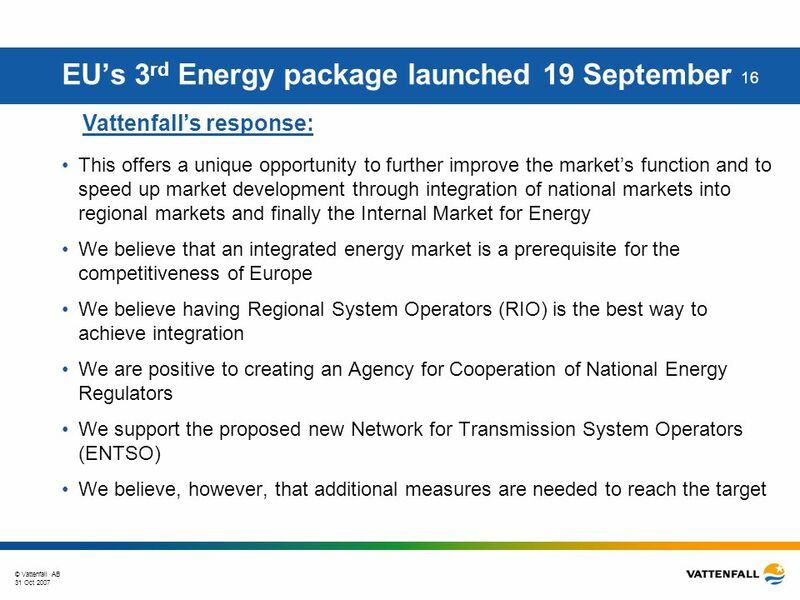 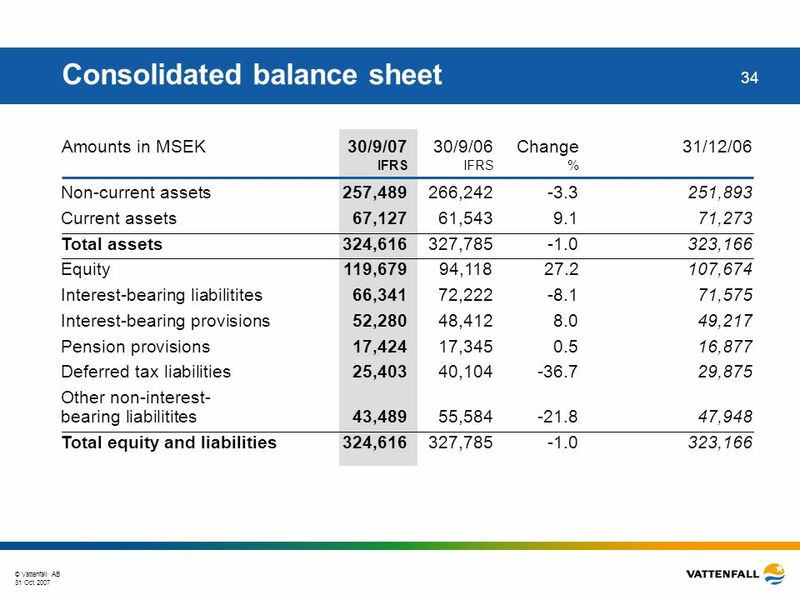 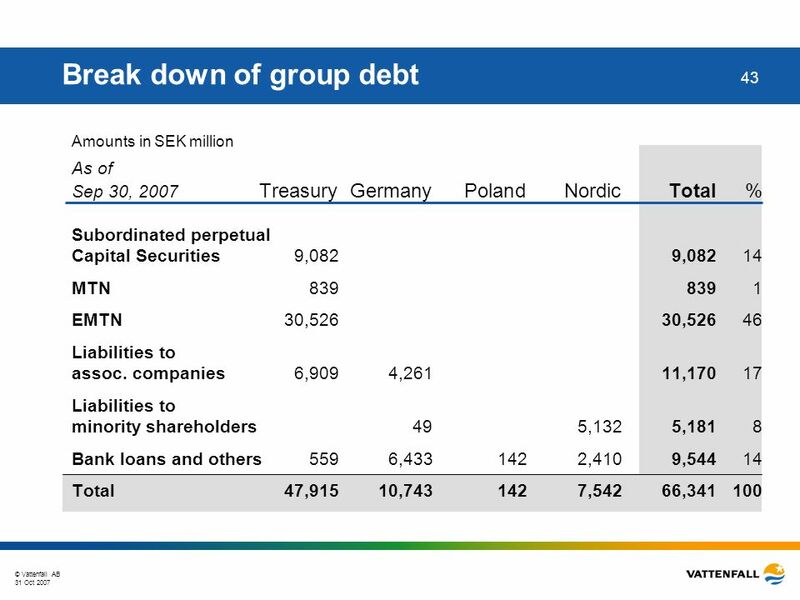 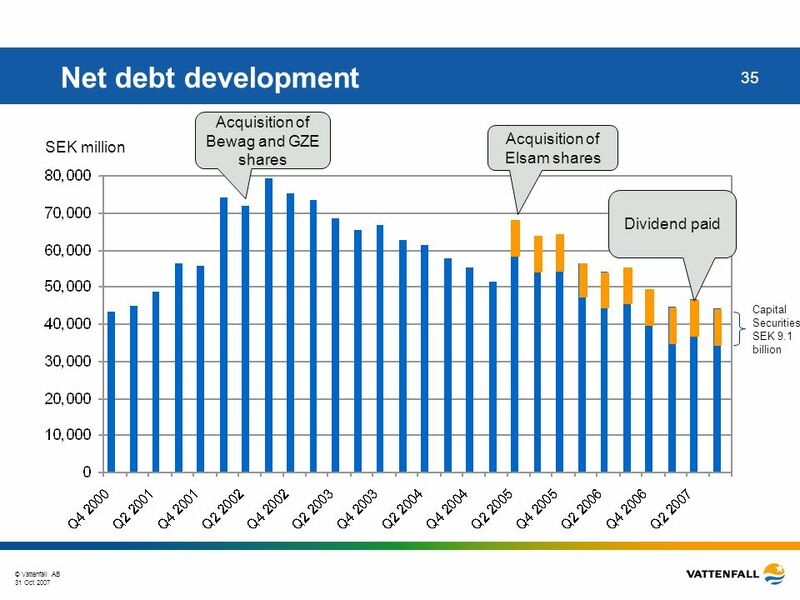 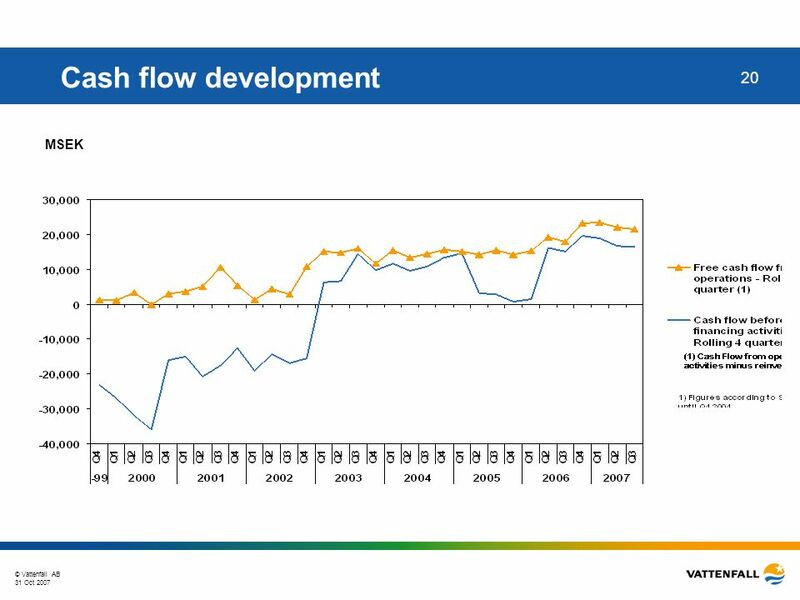 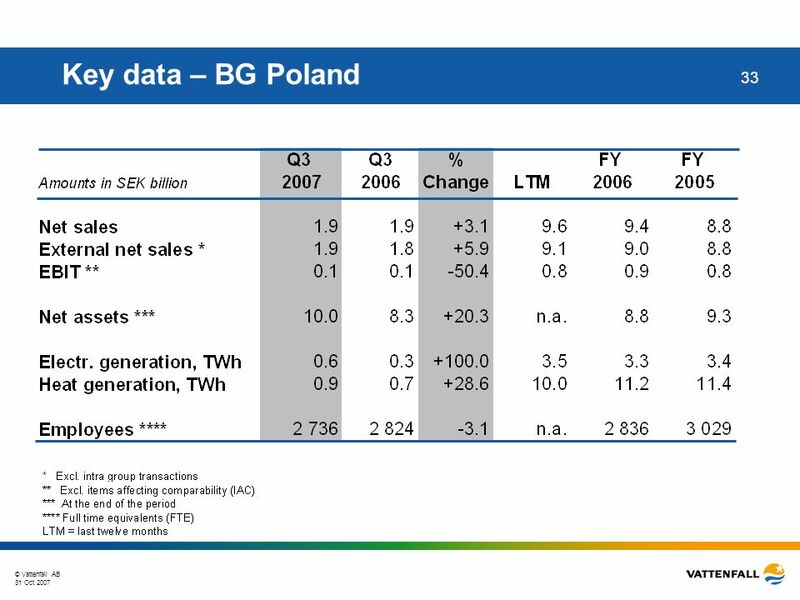 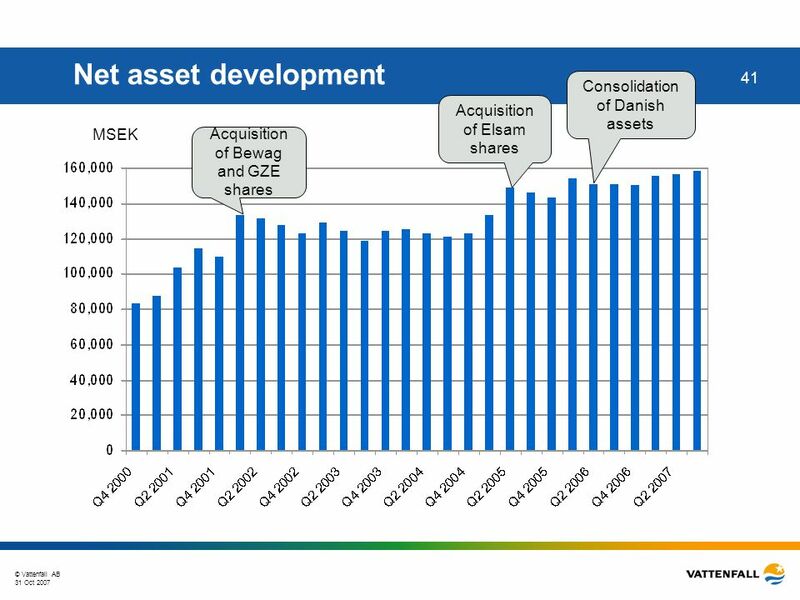 32 © Vattenfall AB 31 Oct 2007 32 Highlights Q3 2007 - Poland EBIT decreased by 37% from SEK 125 million to SEK 79 million (-50.4% excl IAC). 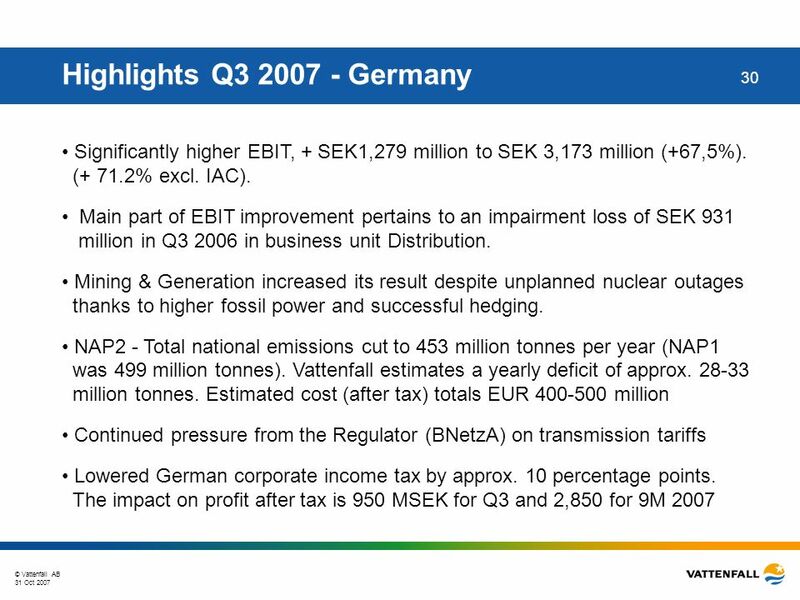 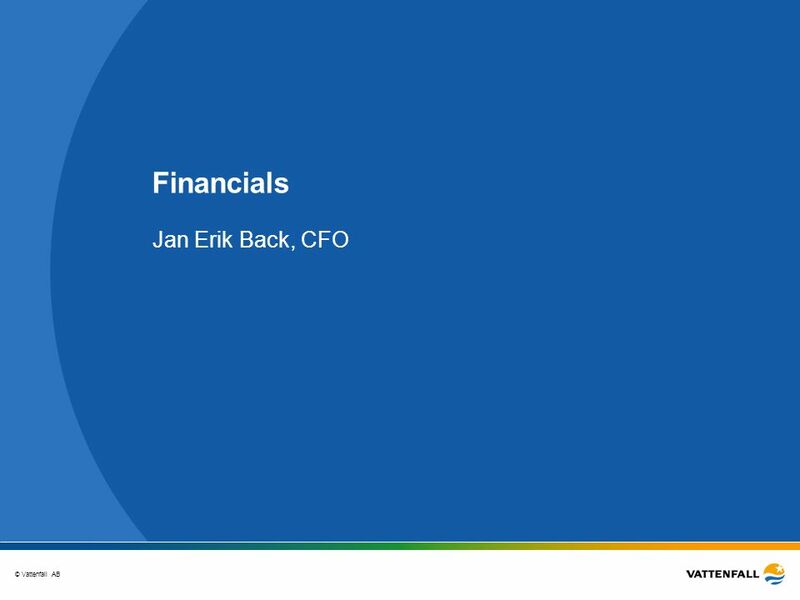 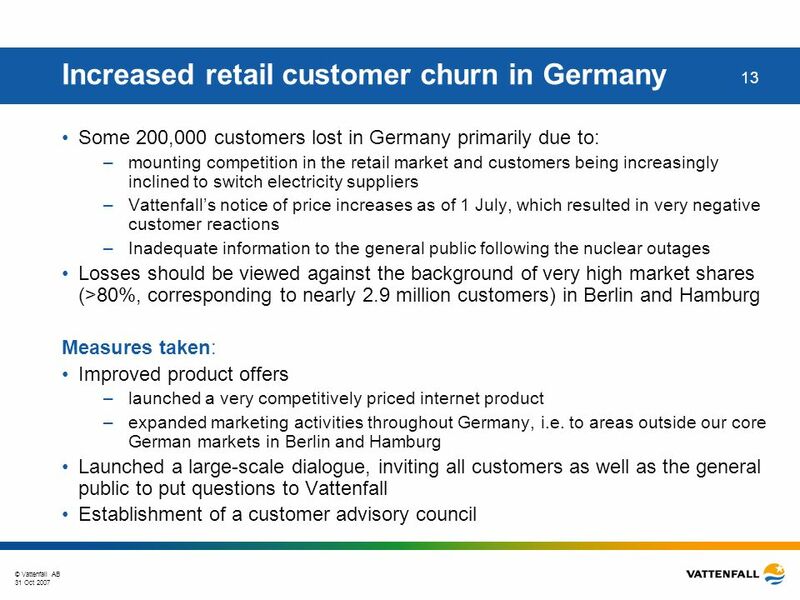 EBIT reduction pertains mainly to Distribution due lower volumes and squeezed margins. 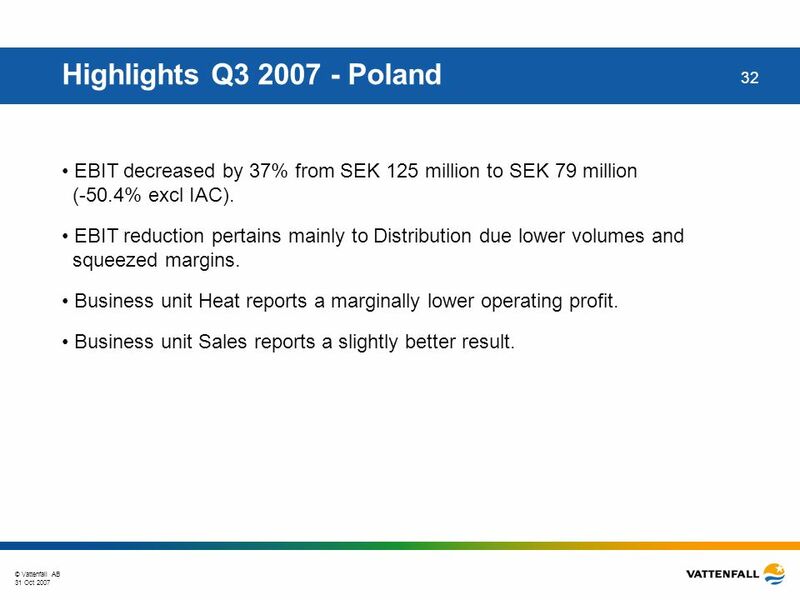 Business unit Heat reports a marginally lower operating profit. 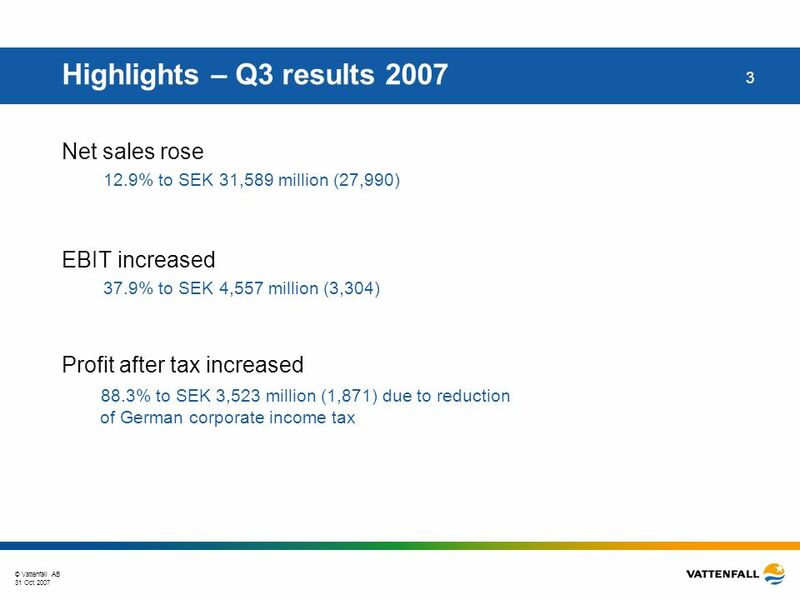 Business unit Sales reports a slightly better result. 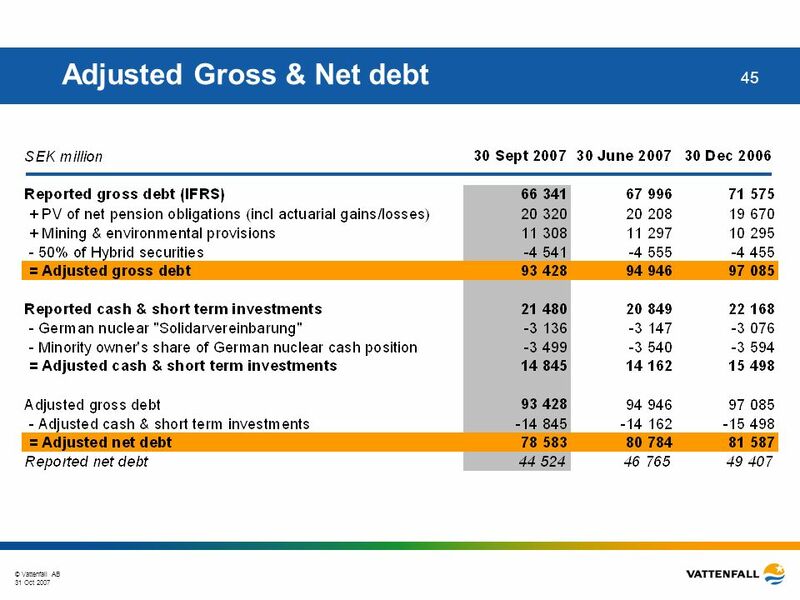 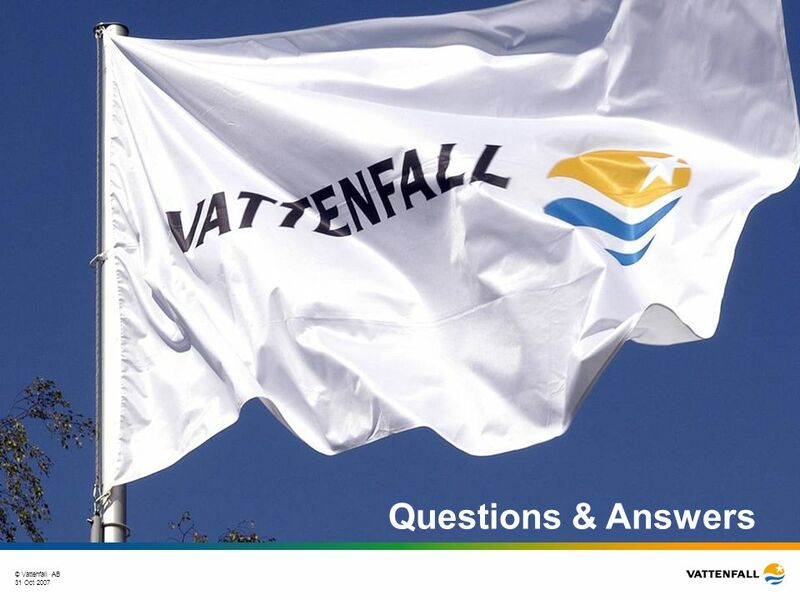 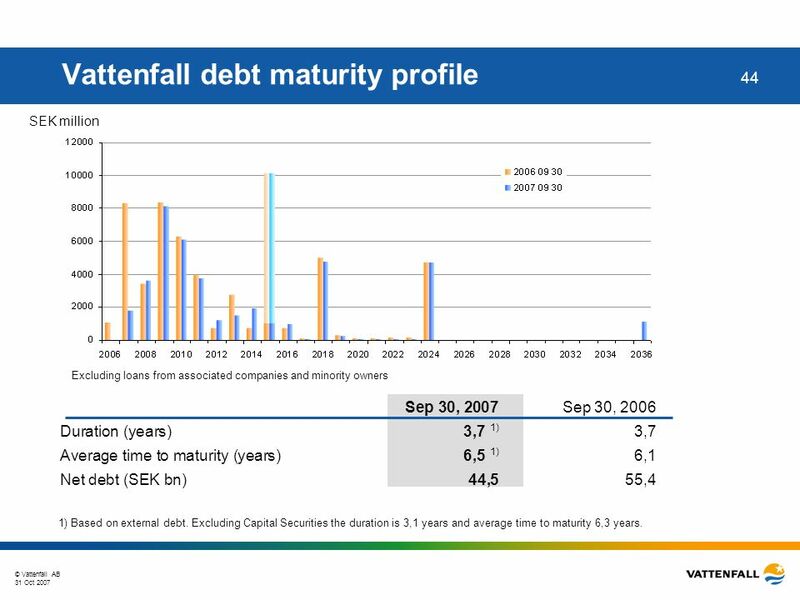 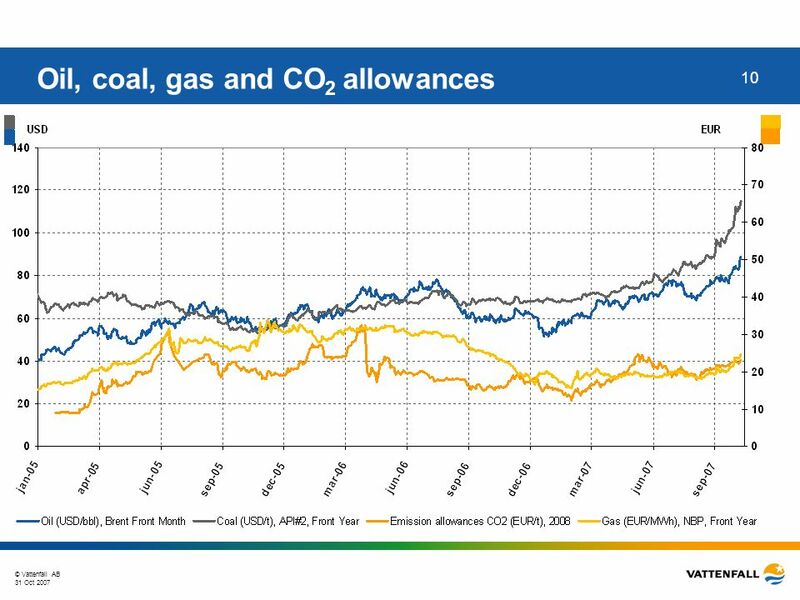 44 © Vattenfall AB 31 Oct 2007 44 Vattenfall debt maturity profile Sep 30, 2007 Sep 30, 2006 Duration (years) 3,7 1) 3,7 Average time to maturity (years) 6,5 1) 6,1 Net debt (SEK bn) 44,5 55,4 SEK million Excluding loans from associated companies and minority owners 1) Based on external debt. 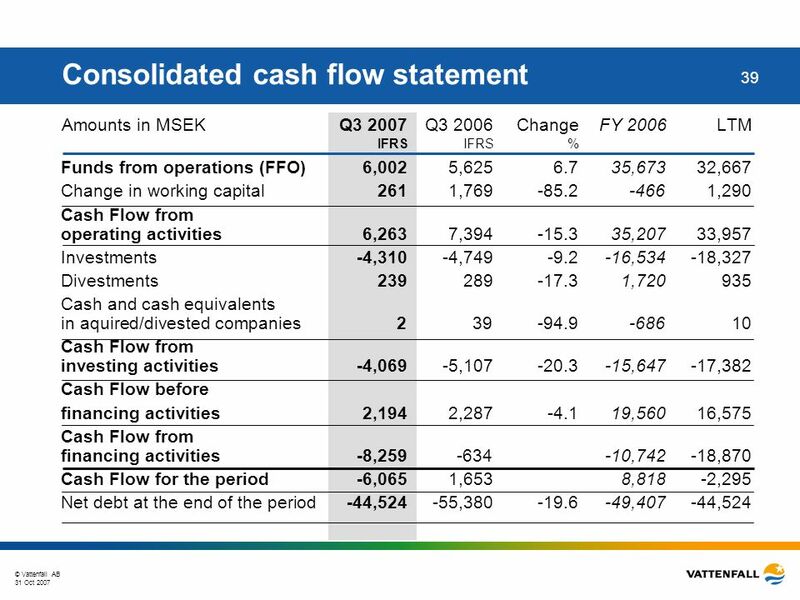 Excluding Capital Securities the duration is 3,1 years and average time to maturity 6,3 years. 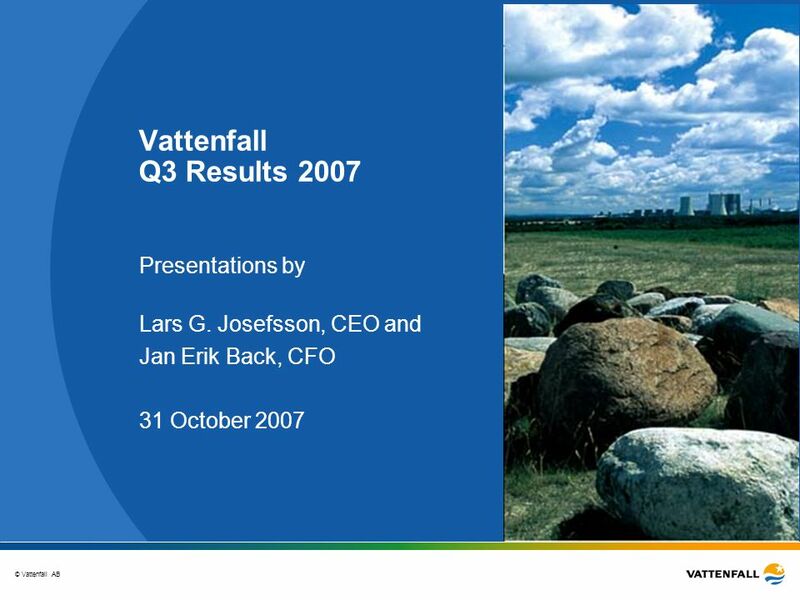 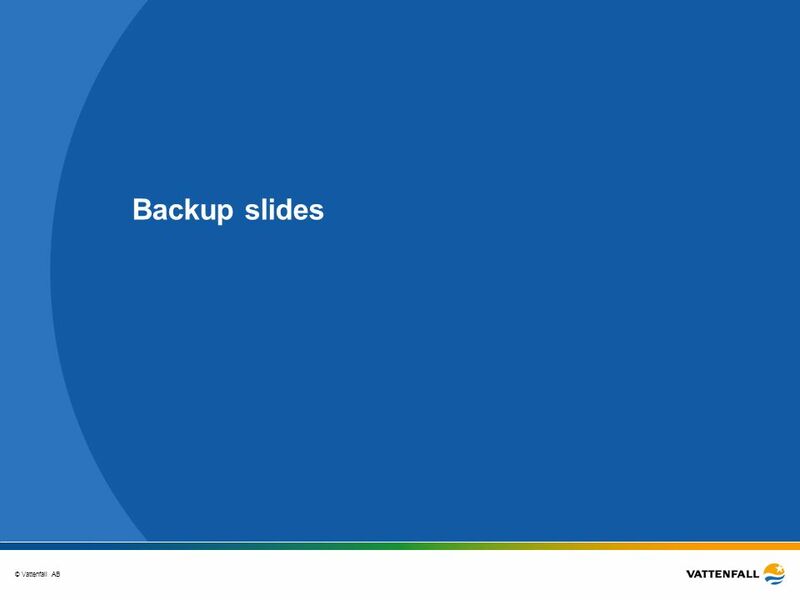 Download ppt "© Vattenfall AB Vattenfall Q3 Results 2007 Presentations by Lars G. Josefsson, CEO and Jan Erik Back, CFO 31 October 2007."